Traindeville: a fascinating journey through traditions, languages and rhythms from different countries. 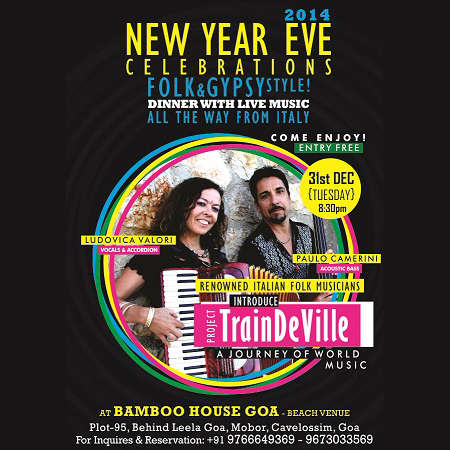 From Balkans gypsy dances to melancholic Jewish tunes, from Argentine Tangos to Cuban Boleros, with a touch of Roman dialect and an eye on American songwriters and also original songs composed by the duo, you will travel on this unique “musical train” and enjoy every minute of it. Paolo Camerini (double bass, acoustic bass) and Ludovica Valori (vocals and accordion) have travelled through India many times. They have spent the first months of 2014 working with the NGO Tara Trust India with a music project in schools and orphanages in Benaulim, Santa Cruz, Verna and Colva (Goa). They also performed at various venues such as Baywatch Resort Live Lounge, Arpora’s Saturday Night Market, Bamboo House, Malibu Beach Bar, Hawaii Beach Bar. While in Italy, they are very active in social projects and often play in theaters, private shows, clubs and street art festivals. They performed on tour in India in 2010 with the project NOW-Nomadic Orchestra of the world, a fusion between rock and traditional music from Rajasthan. In Italy they have various projects: among them Nuove Tribu’ Zulu, folk rock band on stage since the beginning of the nineties.